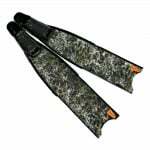 Leadefins fins and monofins are some of the most advanced fins in the world! Offering unmatched comfort, resilience and durability, Leaderfins are the fins of choice for professional and recreational divers and finswimmers alike. • Moisten the fin's foot pockets thoroughly in water. Make sure that water gets inside the foot pockets. • Moisten your feet / your neoprene socks with water. 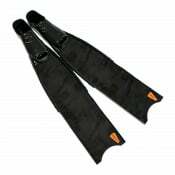 • For tight fitting foot pockets (monofins, finswimming fins etc. ), lather your feet / your neoprene socks with some soap. • Now you are ready to put your fins / monofin on! • Entering the water - fins first. • Hitting sharp / hard objects underwater. The blade's tip is especially vulnerable to this kind of damage. • Make sure to use proper swimming technique (dolphin style), with both of your legs working synchronously. • Enter the water properly, do not jump in the water - monofin first. 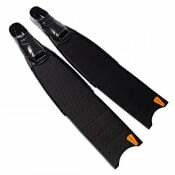 A powerful impact of the monofin against the starting platform or the water surface may cause damage to the fin's blade. • In a pool, make sure to perform the turn properly - with both legs pushing off the pool wall synchronously. Upon receipt of the ordered product from Freedivershop.com check the packaging for damages caused during transportation. In case such damage is detected, the package must be opened in the presence of a courier / postal employee. In the event of damage to the product, the courier / postal worker is obliged to draw up a statement and sign it. For additional information regarding further action, please contact customer support immediately by using our contact form or at the following email address: support@freedivershop.com. Please note that claims for shipping damages must be made within seven days of receipt. • Refund (subject to the terms and conditions of this limited warranty. • The limited warranty period begins at the date of original purchase. • The limited warranty period is one year. • Normal wear and tear such as scratches or abrasions. • Excessive stretching of the rubber parts of the product. • Excessive bending of carbon fiber or fiberglass parts of the product. • Defects caused by rough handling, improper care, negligence, dropping, hitting and crushing of the product. • Defects and damage resulting from use contrary to intended or recommended use of the product. • Damage associated with technically incorrect execution of the turn in the swimming pool (for example, damage caused by legs pushing off the pool wall asynchronously in monofin). • Damage associated with improper swimming style for the product (for example, damage caused by legs are not working synchronously in monofin). • Damage associated with technically incorrect execution of the start (for example, powerful impact of the monofin against the starting platform or powerful impact against the water). • Self-repairs or modifications have been made to the product. • The product has been exposed to temperatures above 50 degrees C.
• The product has been exposed to temperatures below -5 degrees C.
• The product has been stored in direct sunlight. • Leaderfins co. does not warrant that operation of the product will be uninterrupted or without breaking and will not be liable for any occasions occuring during the operation or related to the operation of the product(s). • Leaderfins co. will not be liable for any delay in rendering warranty service. • Proof of purchase must be provided in order to be eligible to Leaderfins customer service. For further instructions regarding product warranty service please contact customer support by using our contact form or at the following email address: support@freedivershop.com. • Claims for wrong item, shipping damage, non-functionality or manufacturing defects must be made within seven days of receipt. The claim must include a detailed description of the issue with the item(s) together with clear photographs of the item(s) portraying the described damage or defect. • Claims for exchange are only accepted for products in new condition, free of damage and scratches. • Manufacturer / shipping damage warranty does not apply to hard fin boxes and they will not be replaced in case of damage during shipping.